It's been one of those days... Not a full on terrible 'I wish I could just die' type of day, just one of those days where you're just not quite you. You're just that much off and it messes with everything you try to do. Ugh. Add to that the fact that I am right in the midst of a majorly unorganized spell. I've got a batch of items to review. Some can't be opened/used until I get photos taken, some are in the testing phases so I'm not ready to review them... let's just say the office portion of my bedroom currently looks like a small drugstore exploded. Actually, that might just be the best kind of explosion. Like, ever. 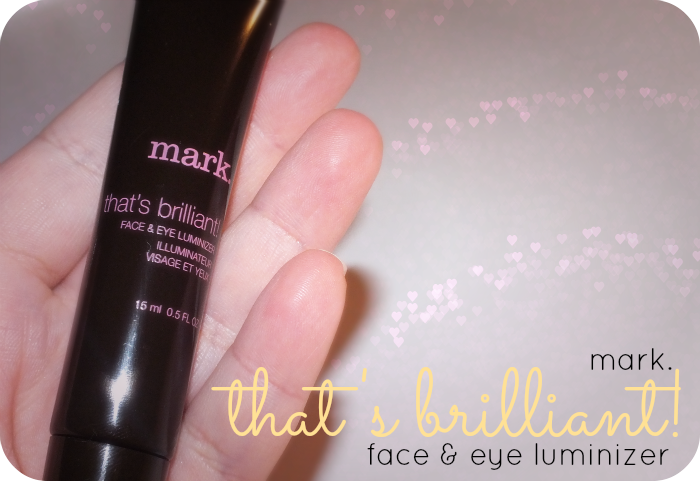 Anyhow, getting past my mess, I do have a neat little product to chat about today: Mark That's Brilliant Face &Eye Luminizer. sweep of the brush! Brush up the cheekbones, under the eyes, across the forehead or anywhere you want to brighten and bring a gorgeous radiance to the skin. 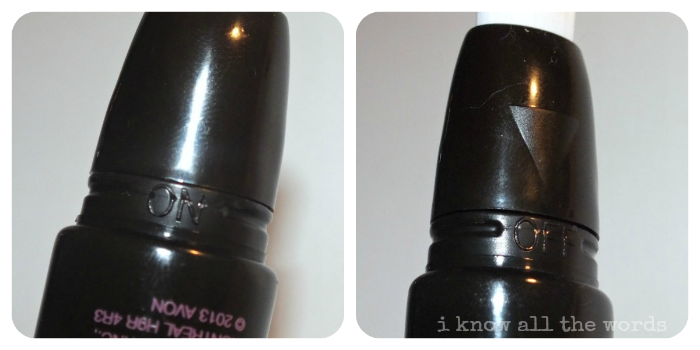 Handy tube packaging features a built-in applicator brush. Apply on bare skin or over foundation' -mark. All too often products that claim to be multi-purpose end up failing in some of the areas they're supposed to work in. I am pleased to report, that this is not one of those products! That said, I was a touch confused when I first saw this. I got that it was an illuminator (illuminator, illuminizor, same deal, both spelled wrong according to spell check), but I used it for what exactly? That's the thing, you can use this for everything. You can apply this on bare skin before foundation; I like to use liquid illuminators like this in conjunction with light bases, like BB cream or tinted moisturizer, for the most benefit. You can use it the typical way, patted over cheekbones, or dab a bit on eyelids for a sheer wash of brightening colour- which we'll discuss in just a few. I wasn't sure about the packaging initially... 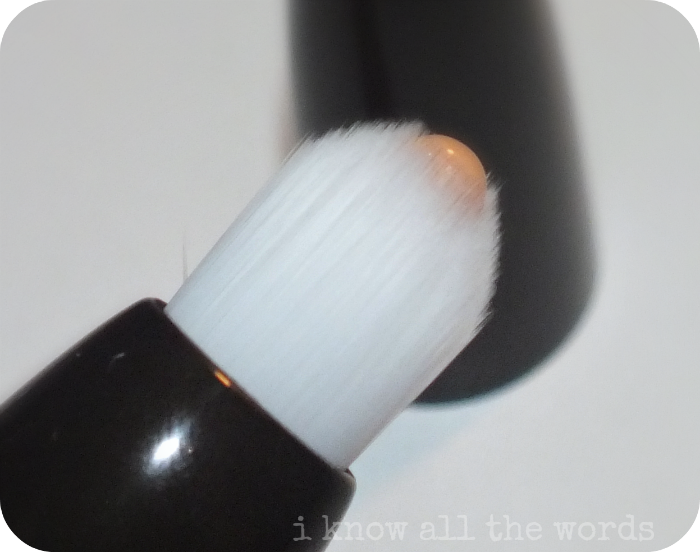 This illuminator is housed in a squeezy tube (much like a lip gloss) but with a medium sized brush. 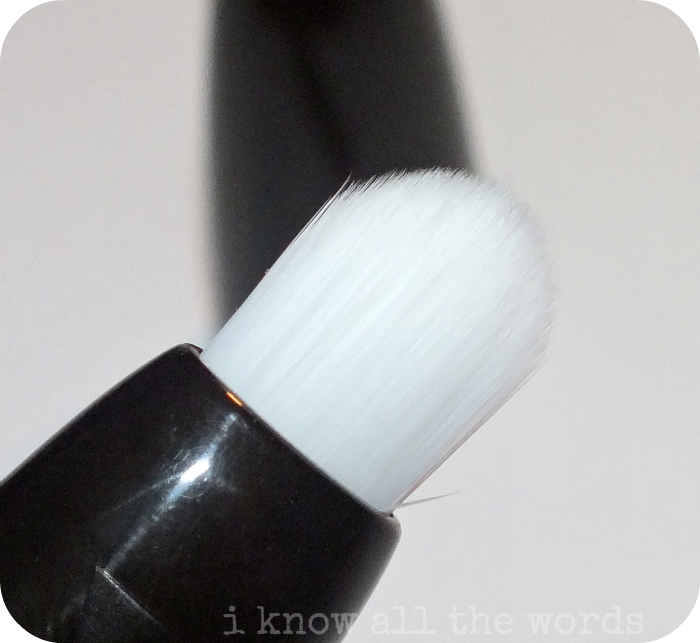 The brush is super soft, like so soft one blogger may have played with it for an inappropriately long time... it's just so soft! When you give the tube a squeeze, the product dispensed up into the brush. I love that the top of the tube has an off/on function (as shown in the first photo.) It is great knowing nothing is going to ooze out of the tube when not in use. 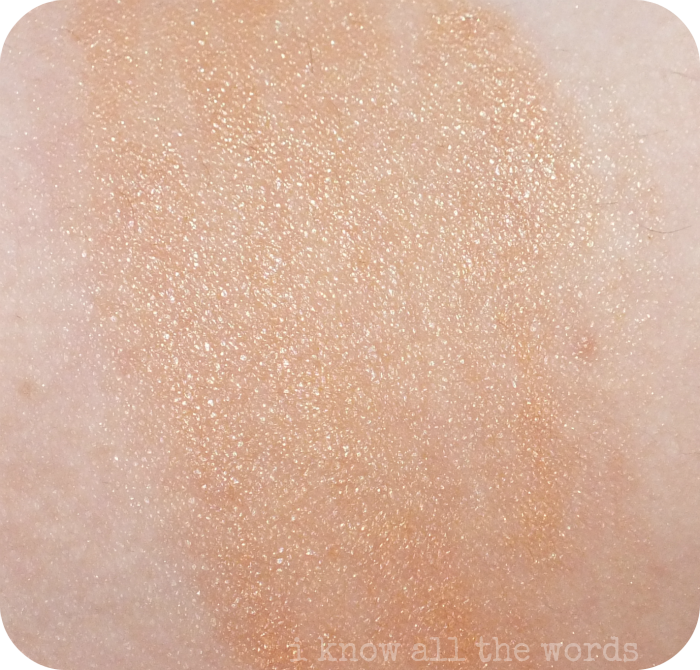 The actual illuminizor is a golden, peachy shade that is luminous. No glitter or pieces of anything here, just a natural glowing quality. 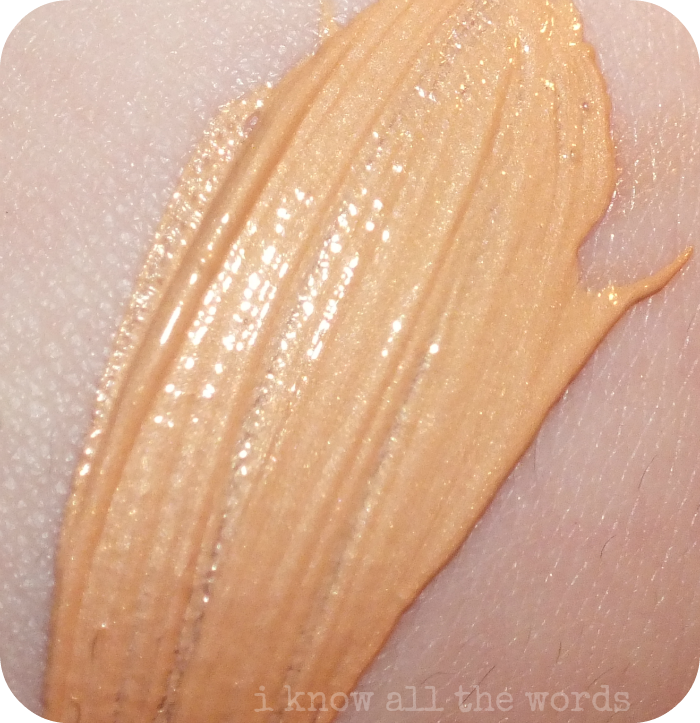 My blended swatch is on the heavy side to show the product better, but you can really customize the colour of this by increasing/decreasing the amount you apply. I love peachy products, so this is perfect for me. I've gotten the most use out of this by applying a light layer all over my moisturized face before applying BB cream. It gives my skin a gorgeous, natural look, without being shimmery or obvious. I also add a bit on cheekbones as highlight as well for a touch more glow. Overall, this is one handy product, since it really can multitask. Do you like liquid highlighting products? What's your favourite?